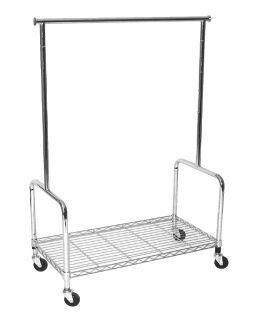 Single bar rolling rack has convenient bottom storage shelf 18" X 35". Adjusts in height at 55", 60", and 65"; 36" between uprights plus a 12" pull-out extension on each end. 58" from shelf & hangrail at highest point. Color: chrome.